Annuals are perfect for adding color to the garden from spring through frost. They are temporary additions, growing quickly and living only one season. With hundreds of new bedding plants introduced every year, there is no shortage of choices when it comes to including seasonal color to your garden. Most annuals prefer sun and well-drained, fertile soil. But even if you have less than ideal conditions, you're sure to find plants you can grow. You'll find impatiens that grow in even the deepest shade. Flowers such as cosmos, gazania, nasturtium, and moss roses grow well in infertile soil. Annuals can be used to create massive carpets of color. Plant varying colors of plants all about the same height. Create a more three-dimensional flower borders with short plants at the front, medium-size plants in the middle, and taller ones at the back. Add summer-long color to perennial beds, shrub borders, and rock gardens with clusters of annuals. Use them to fill in spaces left by spring bulbs and early perennials like poppies, which go dormant after blooming. Mass plantings of seasonal flowering plants are a good way to fill in new beds until you are ready to plant more permanent perennials and shrubs. Combine plants to create colorful containers and hanging baskets. True annuals are plants that go through their entire life cycle-from seed to bloom to seed production to death in one year. Some of the plants typically thought of as annuals are actually biennials, perennials, or shrubs in warmer climates. They are started indoors to encourage early bloom and remain in bloom all summer. When they die in the fall, it's because they can't take our cold or damp winters. Weather a plant is a hardy, half-hardy, or tender annual will determine when they should be started in the spring. Many annuals are available as young plants at garden centers. But if you need lots of plants, are looking for a particular variety, or just enjoy watching things grow, most of these types of plants are easy to start from seed. When to sow your seed depends on your climate and how long a particular plant takes to flower from seed. Check the back of the seed packet for this information. If you live in an area with a short growing season, you will need to start some seeds indoors. 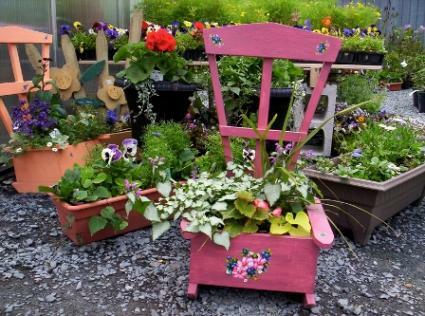 When buying bedding plants, try to resist the plants that are already in full bloom. Because these plants are overmature, they will be slow to produce new roots and tend to grow poorly once planted in the ground. Younger plants that are not blooming yet or are just in bud are a better choice. Once planted, they will quickly send out new roots, shoots, and leaves. Soon they will be large, healthy plants that are full of flowers. If you do buy small plants that are already in bloom, pinch off all the flowers when you plant them. This will encourage the plants to sprout new roots and shoots. Besides looking for plants that aren't in full bloom, watch out for any plants with signs of distress. Bad signs include yellowed or spotted leaves, scraggly growth, wilted stems, and visible insects. Look for plants with dense, lush foliage. There's nothing wrong with mixing colors at random. But a color scheme will make your garden look a little more planned. Warm colors, like yellow and red, can make a large garden seem more vibrant and intimate. Cool colors, like green and blue, make the garden seem calmer. Monochromatic displays can also be lovely. Or try combining complementary colors such as blue and orange. Foliage and flowers can be either fine-, medium-, or coarse-textured. Fine foliage such as lotus vine or asparagus fern creates a soft look. A splash of coarse foliage such as flax or canna leaves makes a bold statement. Mix textures and forms to create interesting garden displays. Avoid planting these types of flowers in straight lines. Lines are hard to maintain; it only takes one dead plant to ruin the whole effect. Instead, plant in curves or waves. Repeat spots of color throughout the garden. Reserve straight lines for very formal gardens. When designing with annuals, just be yourself. Combine your favorite plants and colors in ways that suit your style. It's your garden, after all.